Content on ribosomes proved popular with attendees. More than 40 organizations expressed interest in borrowing the exhibit. A new exhibit from the Bradbury Science Museum was unveiled at the annual conference of the Association of Science-Technology Centers (ASTC) in San Jose, California. ASTC is the premier association for venues that help the general public learn about science; science centers, science museums, children’s museums, arboretums, zoos, and aquariums from around the world belong to ASTC. The exhibit was presented in the conference’s Exhibit Hall, and it garnered great interest from conference attendees. The Museum’s goal in creating and providing the exhibit is to spread knowledge of the Lab’s groundbreaking work and offer the exhibit for loan to other prominent science-learning institutions. Museum director Linda Deck and the Museum’s Operations Manager and Traveling Exhibit Coordinator Stacy Baker were the exhibit’s ambassadors at the conference, talking with hundreds of conference attendees about it. 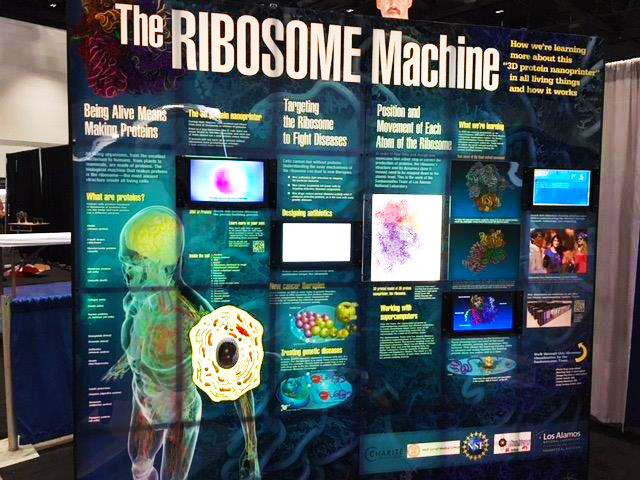 The exhibit, The Ribosome Machine, features the work of Karissa Sanbonmatsu and her team, of the Lab’s Theoretical Division. Team Sanbonmatsu has been known for its simulation and visualization work, using some of the fastest computers in the world, operating on enormous data matrices, to understand the dynamics of molecular “machines” in living things. The team’s latest work, featured in this exhibit, focuses on how the ribosome—a specialized structure that exists in cells of every living thing—moves to string amino acids into protein chains, eventually folding into proteins, that carry out the processes of life. The exhibit is the work of the Ribosome Exhibit Team, which includes content expert Sanbonmatsu, project manager Shannan Schnedler (NM Consortium), writer Elena Giorgi (with the Theoretical Division), and Bradbury Science Museum’s Omar Juveland (designer) and Linda Deck (exhibit developer). It was fabricated by Bradbury staff Robert Naranjo and Michael Martinez, with specialty electronics work by a local company called Mark the Electrician. A “home version” for the Bradbury will be developed and installed in the Museum in 2018.